Different people need different amounts of sleep. Some people function well and are not tired during the day with just 3-4 hours’ sleep a night. Most people need more than this. To need 6-8 hours per night is average. Most people establish a pattern that is normal for them in their early adult life. However, as you become older, it is normal to sleep less. For most people it takes less than thirty minutes to fall asleep. So, everyone is different. What is important is that the amount of sleep that you get should be sufficient for you, and that you usually feel refreshed and not sleepy during the daytime. Therefore, the strict medical definition of insomnia is … ‘difficulty in getting to sleep, difficulty staying asleep, early wakening, or non-restorative sleep despite adequate time and opportunity to sleep, resulting in impaired daytime functioning, such as poor concentration, mood disturbance, and daytime tiredness. You may remember the normal times of being awake in the night. You may feel that to wake in the night is not normal, and worry about getting back off to sleep. You may clock-watch, and check the time each time you wake up. This may make you irritated or anxious, and you are more likely to remember the times of wakefulness. You may then have an impression of having a bad night’s sleep, even when the total amount of time asleep was normal. You may find it difficult to switch off your anxieties about work, home or personal problems. Also, poor sleep is sometimes due to depression. Other symptoms of depression include a low mood, lethargy, poor concentration, tearfulness, and persistent negative thoughts. Depression is common. Treatment of depression or anxiety often cures the poor sleep too. This sometimes occurs in people who snore. In this condition the large airways narrow or collapse as you fall asleep. This not only causes snoring, but also reduces the amount of oxygen that gets to the lungs. This causes you to wake up to breathe properly. You may wake up many times each night which may result in daytime tiredness. See Obstructive Sleep Apnea for details. Alcohol – many people take an alcoholic drink to help sleep. Alcohol actually causes broken sleep and early morning wakefulness. Caffeine – which is in tea, coffee, some soft drinks such as cola, and even chocolate. It is also in some painkiller tablets and other medicines (check the ingredients on the medicine packet). Caffeine is a stimulant and may cause poor sleep. Nicotine (from smoking) is a stimulant, and it would help not to smoke. Street drugs (for example, ecstasy, cocaine, cannabis and amphetamines) can affect sleep. 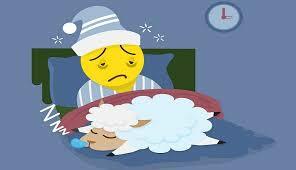 Some medicines sometimes interfere with sleep. For example, ‘water tablets’ (diuretics), some antidepressants, steroids, beta-blockers, some slimming tablets, painkillers containing caffeine, and some cold remedies containing pseudoephedrine. Also, if you suddenly stop taking regular sleeping tablets or other sedative medicines, this can cause rebound poor sleep. Whatever the initial cause, worrying about poor sleep, and worrying about feeling tired the next day, are common reasons for the problem to become worse. Secondary (or comorbid) insomnia occurs when insomnia is a symptom of, or is associated with, other conditions. These can be medical or mental health conditions, or drug or substance misuse. Long-term (or persistent/chronic) if insomnia lasts for four weeks or longer.